Modern scientific medicine is based upon the theory of evolution. Since the human body evolved by chance it is full of errors. According to this model, when disease occurs the body is the enemy and must be beaten into submission with chemicals, surgery, or radiation. The Bible teaches that the human body was designed by a benevolent creator. Intelligent design accepts that the body contains incredible healing mechanisms that can perform miracles when properly supported. This model suggests that when disease occurs the body our the greatest ally, deserving of our support. The first stage of knowledge is the awareness that I don’t know what I don’t know. Growth occurs when new concepts are approached with an open mind and evaluated on their merits, not on prejudice. We are called to be open minded and narrow minded – open to look at new ideas while sifting them through the narrow boundaries of absolute truth. · A Personal Health Crisis: There is nothing like a personal health challenge to get one to search for new answers. · A Personal Spiritual Crisis: Faith matters in the real world. · Crisis in Medicine: The erosion of the physician/patient relationship has done irreparable harm to medicine in the United States. Learn how to take personal responsibility for the maintenance and repair of your own body. How to transition from a disease care mentality to a wellness outlook. How to recognize the difference between true disease prevention and early disease detection. The Health Continuum: The state of one’s health is never stagnant. You are either moving toward improved wellness or sliding toward sickness moment by moment and day by day. 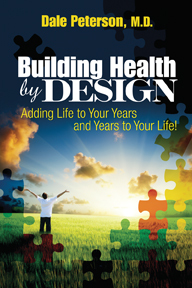 In Building Health by Design You will also Learn Secrets to Adding Life to Your Years and Years to Your Life! Free radical damage is one of the known biochemical causes of disease and premature aging. An understanding of free radicals and the body’s antioxidant defense mechanisms is needed to address this challenge. Chronic inflammation is the second biochemical cause of disease and aging. The causes of chronic inflammation and strategies for addressing them are discussed. The human body is based on the element carbon. The simplest carbon molecule, called a methyl group, is used to manufacture useful compounds and for repair tasks throughout the body. When the body does not have enough methyl groups and the nutrients required to use them a chemical called homocysteine accumulates. Learn why you must know your homocysteine level, and how you can bring it to a safe level! The cells of the body contain energy factories called mitochondria. Mitochondrial decline is another biochemical cause of premature aging and disease development. Discover how to keep your mitochondria running strong as you grow older, and thus avoid age-related loss of energy and stamina. Unearth the secrets to performing at a higher level whether you are a highly-conditioned athlete or so out-of-shape that you get short of breath walking across a room. · Rising Disease Incidence: Learn why the incidence of cancer and diseases of the nervous system have been rising dramatically over the past two decades. · The Human Body and the Electromagnetic Spectrum: The human body operates in the mid range of the electromagnetic spectrum. Discover why exposures to radiation on either side of the spectrum are hazardous to health. · Can a Honey Bee be a Canary? Can the strange disappearances of honey bee colonies be a harbinger of the demise of the human race? · What Does RF/MW Research Show? While industry-funded research shows that exposure to RF/MW radiation is safe, independent studies paint a far different picture. · Does RF/MW Radiation Pose a Risk to Human Health? · Sources of RF/MW Radiation: Why the only place free of RF/MW radiation today is the back side of the moon. · RF/MW Radiation and the Human Nervous System: Diseases of the nervous system are on the rise – largely due to exposure to RF/MW radiation. · RF Syndrome: Are you suffering from a new syndrome that is believed to be affecting at least a third of the population of the earth. · Protective Devices: Understand how manufacturers can produce appliances that provide protection from damaging electromagnetic frequencies. Most of what is going on inside the human body is computerized. Just as man-made computers can fall victim to corrupted files, so the body’s central computer can be compromised by program glitches. Fortunately, the human computer can be restored to its normal operating parameters. When it comes to health challenges, stress causes nothing, but aggravates everything. Effective stress management techniques must be implemented to maintain good health. The greatest challenges to health often arise not out of circumstances, but from the interpretation placed upon those circumstances. The role of spirit beings in human illness is real, and must be addressed when present. Learn how to continually improve your health by concentrating on the basics of wellness. Knowledge without implementation will not bring about desired results. "I routinely see what I would have considered miracles in my former way of approaching illness. They are miracles - not of a suspension of the laws of nature, but of the incredible healing mechanisms that are part of the body’s design." Dale Peterson, M.D.